Joy Creek Photo Archive (c) all rights reserved Our friends the Chikumas have created many delightful small-flowered clematis hybrids using a variety of our North American species. They develop the majority of their plants to be grown in containers. Clematis 'Little Bell Sumire' (2010) is no exception. Compact in height, with linear foliage and inch-long flowers, it is ideal for containers but has also done well in the open garden. Give it a place where it can be seen up close. The somewhat outward facing tubular flowers are a soft violet on the exterior and are a rich violet inside. Because the tips of the sepals recurve, the dark violet is clearly revealed as the flowers mature. 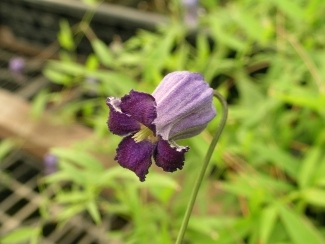 The name 'Little Bell Sumire' is a hybrid as well, using English and Japanese. "Sumire" is the Japanese for violet which describes the color of these small bells. Early to midsummer. 2.5 ft. x 2.5 ft. This plant is herbaceous. Cut it back any time during the winter after the first hard frost.